Dental implants are artificial roots and teeth (usually titanium) that are surgically placed into the upper or lower jaw bone. As a single provider therapy center, we are able to see each patient through every step of the implant process- from extraction to crown! Today's implant dentistry relies heavily on computer based case planning. This technology is rapidly becoming the standard of care by allowing us to deliver an amazing level of precision. This technology provides implant specialists like Dr. Dooley with a clear picture of the patients physical structure, giving us the ability to relate the implant within supporting bone and soft tissue. The implant is then positioned for optimal success insuring the best aesthetic and functional result. 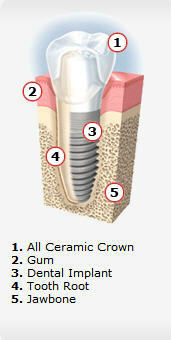 Dr. Dooley will place your implant (anchor), the abutment (structure/ internal "tooth"), and the crown (external "tooth"). Anyone who is missing one or more teeth due to injury, disease or tooth decay may be a candidate for dental implants. The determining factor is the amount of available bone. Dr. Dooley is the best person to evaluate whether dental implants are a viable solution for you. With any surgery, there can be some discomfort. Placing one implant normally causes less discomfort then placing several. Anesthesia and patient sedation are commonly administered to help reduce any discomfort during the dental implant process. Most patients report that they were much more comfortable following the procedure than they had anticipated. Dr. Dooley will prescribe medications to ease any discomfort that may occur. We can recommend you speak with another patient who has already had tooth replacement therapy to assess their personal experience. Your new teeth must be cared for and checked regularly, just like your natural teeth. Brush and floss as recommended by Virgina Beach Implant specialist, Dr. Mary Dooley or your dental hygienist.